Have you spent time checking circular saw accuracy? Did you even know that you should? Whether guiding against a rafter square or straightedge or just following a line freehand, your saw may need adjustment for accurate cutting. That means calibrating your cutline markers and ensuring the shoe sits parallel with the blade. Circular saws have two cutline marking notches, one for square cuts and another for 45° bevel cuts. To check their accuracy, start with the square-cut marker. Each saw in our shootout featured an adjustable set screw for this calibration. Make sure the saw blade is set at exactly 90° to the shoe and cut into a piece of wood a few inches. Guide the saw against a square or straightedge. Stop the blade and back the saw out of the cut while keeping it against the edge guide. See if the kerf made by the blade lines up with the marker. If not, carefully transfer the actual kerf position and width on the saw’s shoe with a permanent marker or, scratch awl. You can also draw on white tape to see the lines better. It helps if the device you’re guiding the saw against is clamped to the wood for this marking operation. If the kerf is in line with one side of the marker but thinner than the notch, mark the missing side below the notch. For truly accurate cutting, you want to be able to cut precisely to either side of your mark consistently. Repeat this process for the bevel cutline marker once you make sure the saw blade is set at 45°. 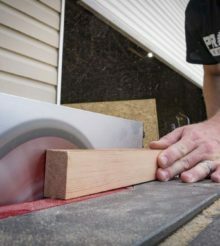 Cutting a flat piece of wood and measuring the resulting angle is often more accurate than measuring the angle between the saw’s shoe and blade. Any waiver in the flatness across the shoe—which, unfortunately, is not uncommon—can throw off your measurement. Checking whether the blade is parallel to the shoe is important. It ensures a true cut whenever you rely on guiding the saw along a square or straightedge. Like the rudder of a ship, the saw will follow the direction the blade points. If the blade skews away from the edge, the saw will track out into the material. If the blade skews toward the edge, the blade will flex and bind, stopping all forward progress. Raising the blade so the teeth only just clear the cut can help by essentially increasing the blade’s flexibility. The more the blade sits in the cut, however, the more it helps keep the cut straight and square. To fix a saw with an out of alignment shoe, check the manual or the brand’s technical service department for advice. You can verify this misalignment by measuring the distance from the edge of the shoe to the blade at the farthest forward and rearward points. My trusty old corded saw has adjustments for blade parallelism, but I rarely see the equivalent on cordless saws. If bolts connect the body of the saw to the shoe, you may have to loosen all of them and re-tighten them with the saw twisted in the desired direction. Failing that, you may have to carefully bend or pry some of the linkage parts that hold the body and shoe together. You may even twist the body and shoe apart. If it’s not an easy fix and the saw is new, take it back. If it’s not returnable, do what it takes to fix it. For the greatest degree of cutting accuracy, you need a saw that will cut straight and true.